With communities racing to meet the national goal of ending veteran homelessness by the end of 2015, every avenue of support in a community becomes more important. In Nashville, Operation Stand Down Tennessee held it’s fall Stand Down event on Nov. 19. Stand Down events are one- or multiple-day resource fairs that provide a myriad of services in one place for homeless veterans to come, feel safe and have camaraderie with other veterans, and access the services they need in one location. This approach can help a veteran feel more comfortable seeking help, as well as eliminate the challenges of going to multiple locations to address multiple needs. 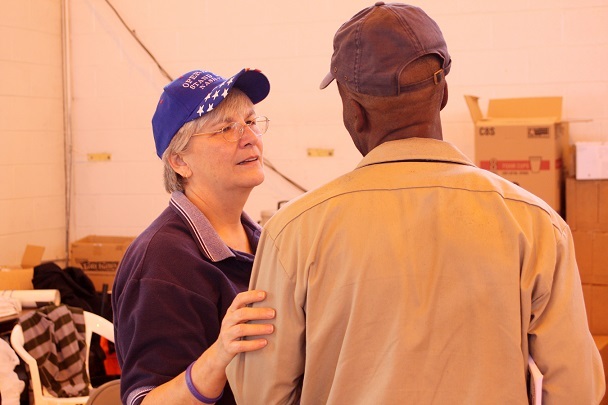 Nashville’s Stand Down event is nationally recognized as a successful model and they often participate in training other providers on the nuances of holding a successful Stand Down. As a participant in the Mayor’s Challenge to End Veteran Homelessness, as well as the Zero:2016 campaign, Nashville continues to be an example of city-wide coordination to end veteran homelessness. For more information on Stand Down or to find an event near you, visit our Stand Down page. See Operation Stand Down Tennessee’s press release for the Stand Down event below, and watch a news report on the event here. NASHVILLE – Operation Stand Down Tennessee held its fall Stand Down Event on Wednesday, Nov. 19 providing coordinated, comprehensive services to Tennessee’s Veterans in need. The event took place at Greater Bethel AME Church at 1300 South Street, Nashville, TN 37212 from 8:00 AM to 4:00 PM. OSDTN has been coordinating Stand Down Events for 22 years. The goal of the event is to bridge many of the physical and psychological barriers between service providers and recipients. The one-day event brings together the support of over 30 organizations such as government agencies, community organizations, veteran service organizations and businesses. Over 100 volunteers give their time to make the event happen. According to the Department of Veterans Affairs, a U.S. military veteran commits suicide every 65 minutes, one in five homeless is a veteran, and in 2013, the average unemployment rate for Tennessee’s veterans was 6.9 percent. These statistics confirm the need to provide intervention and support services for our veterans is greater than ever. And, as more troops come home, the demand for OSDTN’s veteran services will continue to rise. Services are only for men and women veterans and will help with housing assistance, veterans’ benefits, employment, healthcare, food stamps, legal, barber, clothing and other social service agency assistance. Over 150 veterans were served at this event. OSDTN is a full-time 501(c)3 nonprofit agency that assists veterans and their families so they can be self-sustaining and better connected to the community. OSDTN uses a “whole veteran” approach to provide and identify the most appropriate services and support for the best interests of each individual. Specifically, OSDTN’s Veteran Service Center offers military records retrieval, telephone, computer and reliable mail services, food, clothing and transportation as well as coordination of other social services. Transitional Housing provides a home and support for veterans who have issues that have gained control over their lives. OSDTN’s Employment Services help with job readiness, resume preparation, interview skills, employment search and support to maintain employment. Our 12th Avenue Thrift Store serves as a job-training program as well as a primary resource for clothing necessary for employment. For more information about OSDTN, please contact Katie Duckhorn at (615) 248-1981 ext. 109 or visit our website at www.osdtn.org.